Home/Martha Moody, famous writer and Dr. Martin Jacob, Daiton, U.S.A.
“…Excellent–I think Shlomit is a master of figuring out what a student needs and providing it to them in a very low-key but sneakily persistent way…. 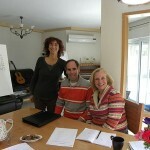 Mart and I are just back from Israel where we stayed in a “home ulpan” for two weeks. An ulpan is a school to learn modern Hebrew, and at this ulpan the students are guests in the teacher’s house as well as her students. excellent–I think Shlomit is a master of figuring out what a student needs and providing it to them in a very low-key but sneakily persistent way. She used a red pen to correct my essays! She listened to me talk about my day and wrote down my mistakes! I loved it. Here’s a photo of Shlomit Chaushu with Mart and me; a photo of Mart with Leah, another Hebrew teacher who works with Shlomit; and a photo of Shlomit and me with my fellow student, Yael. If you’re interested the website is linked below. I’ve been struggling with Hebrew for years, but Shlomit works with learners at any level. Consider this a hearty endorsement.